If you own any one of the X100 series you’ll already know how full it is out there of very cool accessories to pimp your camera. You can put a hood, you can put a filter, you can put a flash, you can put a thumb grip, you can put a half case, you can put a full case, you can put a grip, you can put a neck strap, you can put a wrist strap, you can put a finger strap, you can put a cap, you can put a leather cap, you can put a cap strap, you can put a soft shutter, you can put a teleconverter, you can put a wideconverter, you can put a screen protector, you can put an L-plate for quick release, you can put a sling strap, and all of these you can have in silver or black (to match your X100 series camera) or in any other possible colour. You can. But should you? Well, it really depends what you bought your camera for. If you got your X100, X100S, or X100T to look hipster, then you should probably pimp your camera as much as possible. Make it unique, make it vintage, make it steam-punk, make it huge. People will notice your camera a lot more, which is what you’re looking for. Nothing wrong with that, I guess. But if you intend to make the best out of your camera for what it is, a photographic tool, then you’ll have to be careful about how you dress your camera up. Because you may end up defeating the purpose of such a small, 35mm equivalent, range finder camera: being small, being inconspicuous, being pocketable, being good for both AF and MF. At the same time such a beautiful camera deserves to be dressed only with beautiful accessories. You don’t wont to spoil its look. Looking for functional and beautiful upgrades? Here’s how I coped with the quest. These aren’t accessories, these are things you should buy even before ordering your X100T. Because you’ll need at least one extra battery (while two is better, so you always have a full charged one in your pocket) and you don’t want to take any chance to spoil your LCD screen while choosing the protector. Battery wise, my choice has been for Patoma since a few years already. I never had any issue with their batteries or charger. I got the offer “two batteries plus charger” so now I can charge all the three batteries together if I need to (two in the chargers, one in camera). Screen protector wise, I don’t like films, they are too thin and make bubbles. Instead I love glass protector (GGS like). They do not make bubbles, are ultra clear to see through, and are thick enough to really protect the screen. In the case of an impact, they crack like cars’ windshields, absorbing the most of the impact energy. I saw it happening when one of these glasses saved my old NEX-3, when it felt hard on its screen. The glass cracked (but didn’t explode), the screen survived. For the X100T I found an offer with the screen protector, the hood, and the filter adapter so I got that one. If you want to use the OVF (which you should, otherwise you could have got an X-E or X-M series camera) you can’t have things protruding in the optical frame. Which, I’m really sorry to say, includes the hood. I’m a big fan of hoods, I always use one on all of my lenses, and the scratches they show are the proof of what would have happened to my lenses if I didn’t used them. But if you put a hood on the X100T, you’ll see it covering a large part of the lower right frame in the OVF. What about a filter? Well, one you screw it on the distance-adapter (needed to leave the lens the space it need when close focusing) it will also protrude a little bit. Nothing serious, but still kind of bothering. I found a solution. I have the JJC filter adapter that came with the hood, so I screwed it “reversed” (since I won’t be using the hood) and then I went for a “ultra slim” 49mm filter. With this combination the lens is protected by the filter but I have very little protruding in the frame. Plus, with this setting I can keep using the original Fujifilm metal cap. I took a few shot with my iPhone to show how the different options protrude, you can scroll through them down here. The X100T comes with a more than decent Fujifilm neck strap, which however is to short to be comfortably used across the chest. With the A7 I used a sun-sniper sling strap that worked just fine. On the X100T, however, I don’t like how “modern” it looks, nor the fact that the camera rests upside down and bounces on my hips. Looking for better looking straps I found the Japanese company “Artisan and Artist” and their ACAM-E25R sling strap. The killer feature of this strap is that you can change its length with just one finger and that there’s never “excessive strap” to be worried about. It’s pricey, but I found a good deal on the khaki version on amazon. X100T’s grip is good, but not excellent. I find the original extra grip to be pricey and not too much good looking on the camera. So I went looking into the market of half-cases. Those are (usually leather) cases that cover only the lower part of the cameras, inevitably making the grip slightly larger and the camera slightly taller. Exactly the grip-changes I wanted to operate to my X100T. 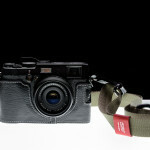 The original Fujifilm leather case provides also an half-case and a new leather strap. It is not too pricey if compared to the alternatives, and it has an opening on the bottom to access the battery/card slot. However, it doesn’t have a tripod mount (so you’ll have to remove the X100T from it if you want to use a tripod). Other more expensive options are the Gariz (with its thick metal bottom), the Luigi’s (no battery opening), the Angelo-pelle’s (no battery opening either), the Kaza (which right now comes only in its deluxe version: full case and leather strap), the Honk Kong TP, and a few more cheap Chinese versions. I decided to go for the TP, because it had all the features I was looking for at an excellent price: convenient battery/card quick access, a tripod mount, free access to the usb little door, an incredibly good looking (and smelling) black leather. I had never used a thumb grip before, so I didn’t even know how it would have changed the experience or if I would have liked it. For these reasons I went for the cheapest black thumb grip I could find. It may be a bit too short, but at least it doesn’t interfere with the access to the exposure compensation dial. Since I use the latter a lot, I’m currently happy with the length of the thumb grip, but I may try a longer one in the future. When the thumb is in position it really makes the grip sturdier. Works perfectly together with the half case to provide a large and strong grip. So, this is my “Belle of the Ball”. No other camera I ever had or used looked (or smelled) so nicely, but that said this is also an accessorised camera perfectly suited for my kind of night, street, and candid photography. The OVF is perfectly clean (almost as much as it was without any filter) but now it is also protected, so I don’t need to keep the cap on the lens for security. This way the camera is always ready to shoot. The original cap still fits, though, so I can wear it on whenever I have to put the camera in a bag or in my pocket, that way protecting the filter from accidental scratching. The combination of the thumb grip with the half case improved the overall grip of the camera without increasing the overall volume of the camera, its weight, or its appearance. All the compartments are as easy to access as they were without the case, as the all the dials (but the shutter speed) and buttons are despite the thumb grip. Actually and I think the X100T looks better with those two accessories, the thumb grip reminds me a lot of the film winder, and the leather is nice looking and pleasant to touch. The strap is the only accessory I didn’t buy in black. I guess black to me it looked a bit too “cheap”, while in khaki all its beautiful textures are well visible. It’s “quick length change” feature is actually helpful and easy to operate, and I’m sure that after a bit of practice it will get as automatic as breathing. Now I just need to go out and enjoy the experience as much as I can. nice write up! I found a great half case for those who don’t want a leather one. The JB camera design grip case provides better grip for your x100t, protection, access to the batt/sd card and ports and has a built in tripod mount without adding anything else to the case. You can check it out on this youtube link. Hey Innes, thanks for stopping by and sharing your thoughts! The camera gets probably a better grip with this JB than with the leather half case, however I personally love the smell of leather that hits me every time I take my eye in the viewfinder, it kind of does the trick and puts me “in the spot”. Cheers! Hi, can you provide links to these accessories? thanks..
the links are already there, they must have passed unnoticed. The little title introducing each of the items is, in fact, a link. Today I got acam-e25r strap, and I also got the khaki one. I love the color but the strap itself seems to be very stiff. It’s been a while since you had the strap, I was just wondering if it will ever get softer. Also, I realized that the ring on the strap fits too tight on the strap lugs so it barely moves and rotate. I think it may be because of the leather part but not sure if it will also become more flexible once the leather is worn out. Hope you can provide some thoughts on the strap! !